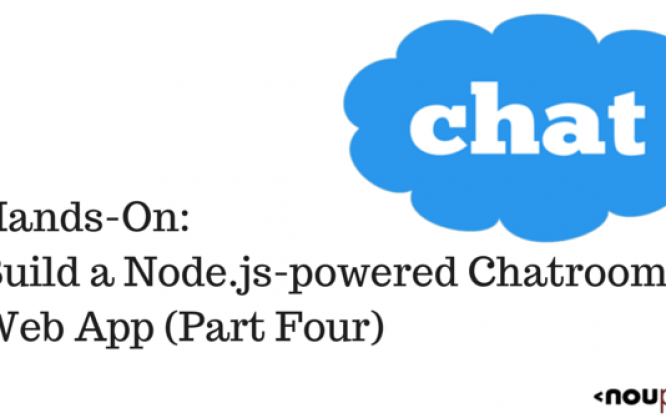 Welcome to Part 4 of the hands-on Node.js tutorial series: Build a Node.js-powered chatroom web app. In this installment, I will show you how to add a Twitter Bootstrap-styled frontend to the chatroom backend you built in Part 2 and Part 3. Bootstrap is a wildly popular HTML and CSS framework for building websites and web applications. It is the number one project on GitHub. Bootstrap supports responsive web design, allowing the layout of your page to adapt to the device (desktop, tablet, mobile). To add Bootstrap to our project, we have to download the minified CSS and JS files for Bootstrap. You can download Bootstrap from this link. After you have downloaded Bootstrap, unzip the file and copy over the folders “css”, “js”, and “fonts” to the “public” folder in your project. Next, we want to add the Bootstrap CSS file links to the header and the appropriate meta tags for HTML5 apps in the layout.jade file. You have to add the following lines right before the line containing the style.css link. It is time to develop the chat user interface layout. First, you might want to read about Bootstrap and take a look at this long tutorial. All chat engines have an area for the recently received messages and an area for a user to write and send a message. Historically, the layout was to have the editing area attached to the bottom and the messages at the top. It is not easy to fix elements on an HTML page to the bottom of the viewport without a bit of work. I will be following this sample to fix a footer to the bottom. We want to modify the index.jade file, and remove all the lines of code under the content block. First, we add the area of the page that will contain messages received. Let’s start by adding a div with the class wrap. In Jade, all you need to write is wrap to generate a <div class=”wrap”></div>. By using the indentation, we can signal to the jade templating engine that more indented elements will go within the less indented elements. Take a look at this Jade tutorial if you missed it in the other tutorials. Next, we want to add another div with the class container-fluid to add a fluid width to the page. Inside, I will create an h1 element that says “Welcome to the Node Chatroom” and a div with an id messages and a final div with the class push that we will use to push down the message editing area of the chatroom to the bottom of the viewport. Next, we are going to develop the message editing area. We want to capture the textbox and send button within a div called footer and a div called container-fluid. The footer div will have the same indentation as the wrap div. Next, I will use the Bootstrap grid system (read about it here) to split the message editing area into two. One of the columns will take the majority of the space and will contain the textbox for writing the message, the second column will contain a block-level button for sending the message. We want to force the message editing area to the bottom of the viewport, we will want to add a few custom CSS in the public/css/style.styl page. This file uses the Stylus CSS preprocessor but you can also paste verbatim CSS that will be recopied into the generated CSS file. First, we will want to ensure the whole page takes up 100% of the height. Second, we want to ensure the wrap area takes up the maximum height it can but leaves a 60px margin at the bottom for our footer and message editing area. Third, we want to ensure that this space for the editing area is respected and to assign it to the footer. Finally, for stylistic reasons, let’s a subtle background color to the footer. Voila! 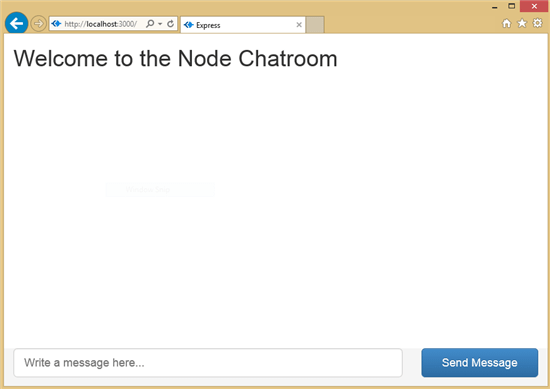 We have used Bootstrap and the Jade/Stylus preprocessors to add a nice UI layout for our chatroom that is served by Node. In the next installment, I will show you how to connect the UI and the node backend via WebSockets. 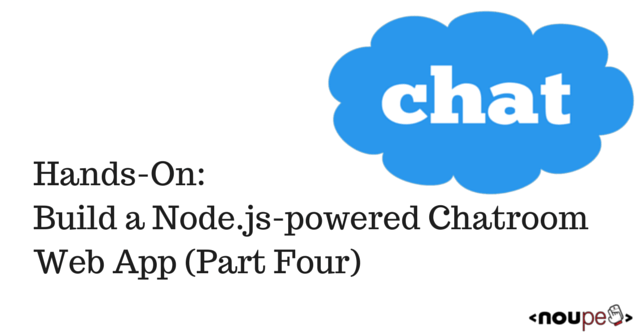 Part 5 — Connecting the Chatroom with WebSockets — will be posted to Noupe soon, and is also located on my blog here. You can stay up-to-date on this and other articles by following my twitter account: @ramisayar.